the world is mine: marvelous! For the first time jade is used for the Beijing Olympic medals. The medals have been designed with inspiration coming from "bi", China's ancient jade piece inscribed with a dragon pattern. The medals symbolise nobility and virtue and are the embodiment of traditional Chinese values of ethics and honour, emitting a strong Chinese flavour. The winners’ medal is made of gold weighing not less than six grammes each. The medal for the runner-up is made of pure silver. 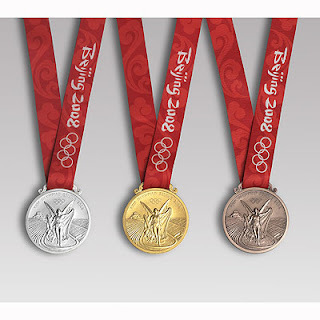 Noble and elegant, the medals are a blending of traditional Chinese culture and Olympism. On their obverse side, the medals reflect the Greek character of the Olympic Games: the goddess of victory Nike pictured in the Panathinaikos Stadium. 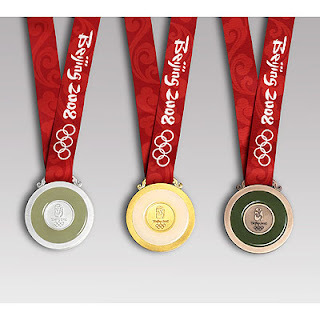 While on their reverse side, the medals are inlaid with jade with the Beijing Games emblem engraved in the metal centrepiece. The design inspiration of the medal hook derives from jade "huang", a ceremonial jade piece decorated with a double dragon pattern and "Pu", the reed mat pattern. The design of the aluminum Torch takes into account Chinese artistic heritage and technological expertise. 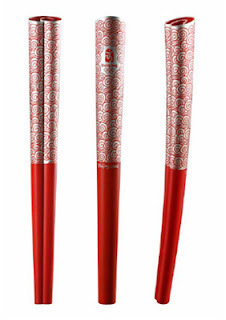 The torch features traditional scrolls and a traditional Chinese design called "Lucky Cloud". It stands 72 centimeters high and weighs 985 grams.